A 1/16 inch laminate with 1 ounce copper per square foot. This flame retardant laminate is translucent in color and made of continuous woven glass cloth impregnated with epoxy resin. Developed specifically for the circuit processing industries' requirements. Complies with Mil-S-13949H-GFK. Provides ultraviolet blocking and fluoroescence when using automated optical inspection (AOI). UL# E37002A; 4/5/91 Our presensitized boards provide high resolution and excellent fine line control. They are ideal for prototypes, small production runs, and student training. 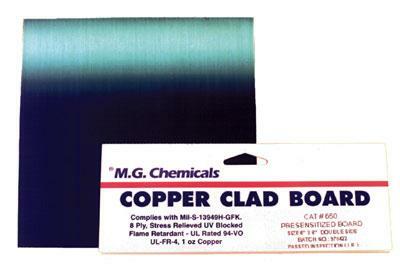 Circuit Specialists also stocks photochemicals for etching your boards.